Most happening young and handsome hero Sharwanand is all set to continue his winning momentum for upcoming flick titled Padi Padi Leche Manasu in the direction of Hanu Raghavapudi. Off late, Hanu made a mark of his own in handling the romantic subjects all the way from poetically narrated Andala Rakshasi. “Padi Padi Leche Manasu is creatively a different film. On this day coinciding with the occasion of our hero Sharwanand’s birthday, we are pleased to unveil the first look birthday poster. Currently, our team is located in Kolkata shooting important scenes and an action episode with lead pair Sharwanand and Sai Pallavi along with key artistes like Murali Sharma in the unit. This is a lengthy schedule shot in action command from Venkat Master. Music by Vishal Chandrasekhar and camera work by Jaya Krishna will be the romantic USP of PPLM. With a class n catchy title on most successful hero, we have received super positive response across all section of audience. 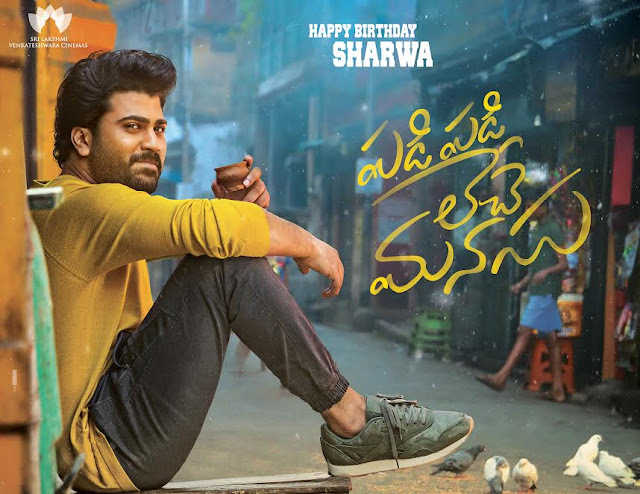 Here by wishing Sharwanand a very happy birthday,” said producers Sudhakar Cherukuri, Prasad Chukkapalli.